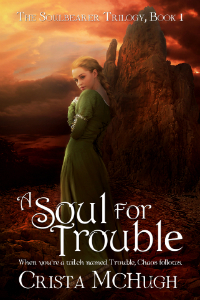 A Soul for Trouble is one of my review books for the SPFBO event. We’re now into the second stage and this was one of the ten remaining books. I confess I’ve struggled with this review because I want to be fair to the author and in terms of the writing and concept this was really promising, however, and I admit it quite openly, I’m not a romance reader. Now, clearly, sometimes a fantasy book will have elements of romance in it and that’s fine but this felt like a romance book with elements of fantasy so it simply wasn’t for me. Basically, I think the author has a good writing style. I have no criticisms at all in that respect. In fact it was an incredibly easy book to read – again, it’s more of a ‘content’ issue for me. In terms of the world, we have a magical world where men, elves, gods and necromancers exist (and probably so much more). The world of men (Ranello) still seems a little in the dark ages. Religion is closely watched and magic has been banned outright. The people of Ranello are deeply suspicious of anyone who steps outside their perception of ‘normal’ treating them with fear and distrust and as such the female of the piece, being very different from the rest of the population, is ignored at best and disliked at worst. The elves (of Gravaria) are more enlightened and accepting of difference and change although (from the few snatches we got of their background) seem to be overburdened with politics and power struggles. The premise. The story revolves around the disembodied God of Chaos, Loku, who must now take up residence in a human vessel. There is a history to this but I won’t go into it. Bascially Loku now resides within a human and when that human body expires he must jump to his next host. Now, whilst most people would object to being used in this manner (not to mention that they would probably find the constant stream of banter running inside their head incredibly irritating) there are those who would seek to wield Loku’s magic – and clearly the only way to do so would be to become the host. So, we have the ‘baddy’ of the piece. An evil necromancer, named Sulaino, who seeks even more powerful magic and is therefore chasing the host. Fortunately the role of host comes resplendent with it’s own bodyguard in the guise of Ser Devarian Tell’brien of Gravaria – an elf with responsibility for protecting the current host and preventing said evil necromancer from getting his grabby hands on even more magic. Characters. We really have three central figures – the others pale a little by comparison. Arden (or Trouble as she is frequently known). The central female of the piece. Arden has been orphaned and left in the care of a local village inn keeper. Being different from the rest of the population, in terms of looks, and living in Ranello, well we know how that’s going to pan out, but on top of this Arden seems to be hiding the fact that she can wield magic. Arden is about to unwittingly become the next host to Loku. The elf, Dev for short, is the protector of the piece. He has a companion in the form of a fire wolf called Cinder. Dev also is able to wield magic but travels through Ranello under the protection of his own kind and therefore free of any risk of being burnt at the stake! The other main character is Prince Kell. The third prince of the realm but clearly the favourite of the King. Kell seems to be one of those characters who is dashing and handsome, he bravely goes to fight the good fight and women seem to want to throw themselves willingly at his feet. Now, the characters are probably my main criticism. Arden is the Cinderella character of the piece. Raised in oblivion she seems very put upon indeed until her untimely possession and rescue at the hands of Dev. Of course she falls a little in love with her rescuer. Arden really did get on my nerves to be honest. She’s a teenage-girl’s-dream-come-true type character. Plucked from obscurity it turns out that not only is she more powerfully magical than anybody ever expected (and now even more so with Loku in situ) but she’s also quite stunning when you take off her apron. She’s a quick study, becoming adept with a sword after literally a few weeks and pirouetting around with a sword with gay aplomb (and managing to not poke out an eye in the process). The male characters of the piece are totally beguiled by her (although she is a witch so perhaps she’s practising her nefarious arts!). Dev and Kell from this point in the story seem to spend the rest of their time either being within a hair’s breadth of ravishing her or taking time out to readjust the uncomfortable front of their pants. Yes, despite the fact that we have an evil necromancer and an army of undead storming around the countryside the two most proficient characters of the piece spend the majority of the book either beating their manly chests and butting heads together or trying to become more comfortable with the over full front on their trousers! On top of this, Arden is a bit of a child in terms of temperament. She has a very sulky type nature, she’s stubborn and takes any form of rejection (even if it’s not really a rejection) as a reason to rush straight into somebody else’s arms, even if they’re not the arms she’s thinking of. Dev – I didn’t mind this character although considering how long he has served as a protector his abilities leave a little bit to be desired. In fairness most of the blood in his body was usually rushing to one particular area so his ability to do anything else was probably a little impaired. And so the despicable love triangle enters the scene, (Although in fairness I think the eventual outcome of this is as plain as the nose on your face). For the avoidance of doubt, I didn’t hate this book. It was very easy to read and clearly I’m not the target audience. Also, whilst I don’t really read romance I’m not totally averse to it, My main issue really was niggles with a couple of the main characters and the fact that this felt predominantly romance with fantasy more as a second thought. I’ve put off writing this review, too…. For the exact same reasons. It’s taken me ages – I could have written more but to be honest I was trying really hard not to be over negative. I certainly didn’t hate it and strangely enough it’s one of the quickest reads I’ve had recently! Just too much romance, Arden was annoying (at best) and I did find myself eye rolling so much that I got a headache. It’s still fascinating to me how the non-male readers of this book are the ones who seem to have the largest problems with the characters and the content. I dunno, maybe the males in the SPFBO challenge are just more predisposed to romance than you and I and Sarah, or maybe a lot of the problems we had just didn’t touch the same nerves with guys that it did on different sides of the gender coin. Either way, still interesting. Hey – maybe they’re all big romantics! Agree. Have not read this, but seems that Lynn was really trying to be objective. Not easy! Thanks – I do struggle with these reviews. I much prefer the ones where I can gush with abandon! Yeah, it wasn’t for me but oddly it was very readable – I just found myself being a little exasperated with Arden and that’s, more than anything, what probably put me off. Be aware if you do pick it up that I think this is very much aimed at YA – so the romance is very much written with that audience in mind.